Designed to empower women to move safely and effectively and nourish their bodies throughout pregnancy, birth and beyond. 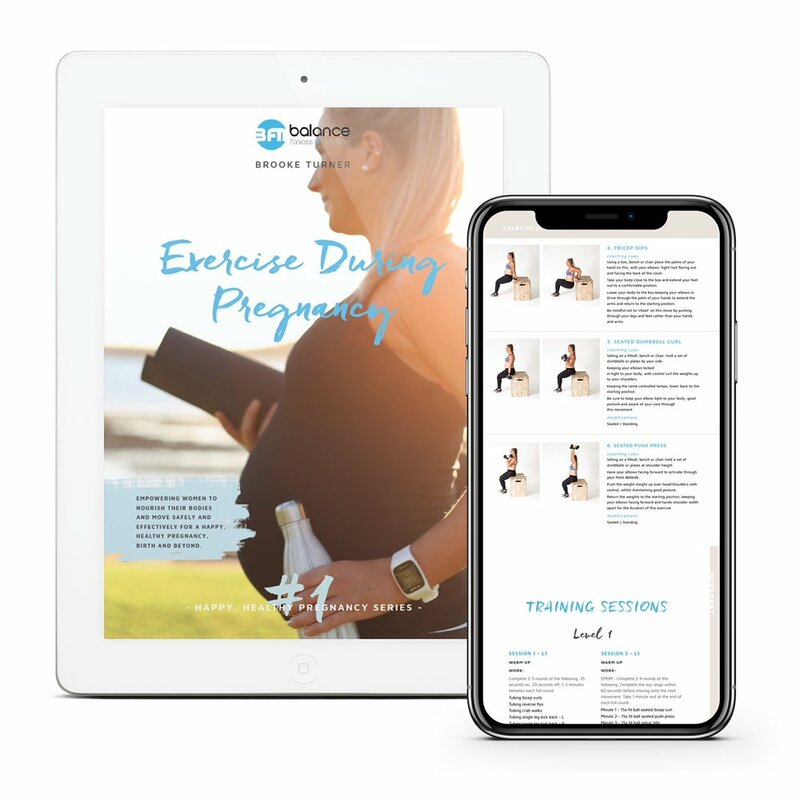 These eGuides make a three part series covering everything women need to know about exercise, nutrition and leading a healthy, balanced lifestyle during pregnancy right through to breastfeeding and post natal recovery. This series of Guides has been a labour of love and designed to empower women throughout their pregnancy and beyond to eat and move in a safe, enjoyable and effective way for this beautiful, challenging and exciting time in their life. 30 pregnancy safe workouts for home or gym covering over 60 exercises. Considerations for each trimester & contraindications to exercise. Pelvic floor & abdominal health. Exercise intensity, type, duration and frequency. Other key elements including sleep and mindset + more! 30+ healthy, simple and delicious recipes to nourish both mum and bub. Example shopping lists and weekly meal guides. Benefits of sound nutrition during pregnancy. Macronutrient, Micronutrient and Energy requirements and sources. Weight gain and pregnancy, being prepared, top tips and what to avoid. Common nutritional concerns and how nutrition can assist. Other key elements for a happy, healthy pregnancy including sleep, mindset and more. 30 training sessions appropriate for post natal women that can be done at home or the gym. Comprehensive exercise glossary complete with images, coaching cues, considerations and modifications. Suitable modifications to movements to help empower women to train safely. Postnatal exercise considerations including the postnatal pelvic floor & abdominals. Promoting post birth recovery through nutrition. Energy requirements, macronutrients, micronutrients and breastfeeding. Milk supply, diet and lactogenic foods. Foods, beverages fussiness and gas. Example daily meal plans & shopping list. All of the above in one, must-have guide!